Singers, Musicians, Dancers, Bands, Magicians, Jugglers and acts of all kinds! An audio / video files / link to a currently posted youtube video that showcase your talent. All audition materials must be submitted by Saturday, August 25! Notification will be completed by Wednesday, August 27. Up to 20 acts can be chosen to compete on Thursday, September 6. A panel of three judges will evaluate each act. Nine acts will be chosen to compete on Sunday, September 9th for the top three prizes – First place being $150, second $100, and third $75. Fairs Got Talent Categories will consist of individual, duets, and groups. A sound system will be provided with a sound tech and a CD player, phone auxiliary cord. CD accompaniments must have the lead vocal tracks completely removed! Instrumental and harmony tracks are okay. Bands will be expected to provide their own amps, keyboards, drums, etc., and to set up and remove their equipment. All performances must be suitable for the family atmosphere at the stage. 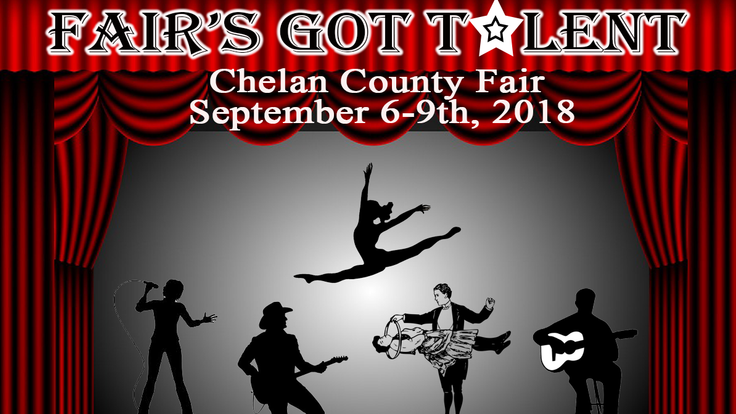 Complete the Fair’s Got Talent Show Registration Form. Performers under 18 get a pass and one for a parent/guardian. Performers 18 and over get a pass for themselves.